The regulation of monocyte function and the inhibition of TNF-α production during bacterial sepsis are critical in attenuating adverse host responses to endotoxemia. To study the function of a novel receptor tyrosine kinase, mer, that is expressed in monocytes, we generated mice (merkd) that lack the signaling tyrosine kinase domain. Upon LPS challenge, merkd animals died of endotoxic shock (15/17, 88.2%), whereas control wild-type mice survived (1/15, 6.7% died). Susceptible merkd mice exhibited edema, leukocyte infiltration, and signs of endotoxic shock that correlated with higher levels of TNF-α found in the serum of merkd mice as compared with wild-type control animals. Death due to LPS-induced endotoxic shock in merkd mice was blocked by administration of anti-TNF-α Ab, suggesting that overproduction of this cytokine was principally responsible for the heightened suseptibility. The increase in TNF-α production appeared to be the result of a substantial increase in the LPS-dependent activation of NF-κB nuclear translocation resulting in greater TNF-α production by macrophages from merkd mice. Thus, Mer receptor tyrosine kinase signaling participates in a novel inhibitory pathway in macrophages important for regulating TNF-α secretion and attenuating endotoxic shock. Recently, a new cell surface receptor subclass was established with the identification of the Axl/Mer/Eyk/Tyro 3/Rek family of receptor tyrosine kinases. Each of these members has similar extracellular motifs (two Ig-like and two fibronectin-type III domains) and a signature KWIAIES motif in the tyrosine kinase domain 1, 2, 3 . Some members of this family appear to be involved in growth control. Axl was isolated as a transfected oncogene 1 , and the Eyk sequence was transduced to give the chicken retroviral oncogene-Ryk 4 . Overexpression of Axl, Tyro 3, and Rek, as well as activation of a Mer chimeric receptor, can cause growth and/or transformation in NIH3T3 fibroblast cells 5, 6, 7 . Previous work showed that mer is expressed in hematopoietic tissues during development 8 and in neoplastic lymphocyte lines 8 as well as acute lymphoblast leukemia samples (our unpublished observation). While the pattern of tissue-specific expression and the function of overexpressed or experimentally activated receptors of this class is known, there is little, if any, information regarding the physiologic function of these receptors. Since mer is the only subfamily member expressed in mature monocytes, we investigated whether Mer had a specific role in immune or inflammatory function 9 . One major immune reaction mediated by monocytes is the response to bacterial Ags during inflammation or sepsis 9 . Bacterial endotoxin is one of the most potent initiators of the inflammatory response that results in >100,000 deaths annually, ranking it 13th among all causes of deaths in the United States 10, 11, 12 . LPS endotoxin is a component of Gram-negative bacteria that activates monocytes and macrophages by binding the glycosylphosphatidylinositol (GPI)-linked glycoprotein, CD14 9, 13 . Subsequent to surface binding, LPS results in the induction of NF-κB and the initiation of proinflammatory cascade of cytokines, including TNF-α, IL-1, and IL-6 9, 14 in macrophages. When unabated, the host response to sepsis causes cellular damage and lethal tissue injury characteristic of endotoxic shock syndrome 15, 16 . Reduction of NF-κB in vivo by i.v. somatic gene transfer with IκBα before lethal LPS challenge increased survival of mice 17 . Thus, mechanisms that inhibit LPS induction of NF-κB presumably would attenuate host immune responses to sepsis. To further investigate the physiological function of Mer, we generated gene-targeted mice (merkd) in which the cytoplasmic kinase domain was replaced with the neomycin-resistant gene. The mice were without developmental or growth-related anomalies. However, investigation of monocyte function showed that the merkd mice were extremely sensitive to endotoxin (LPS) treatment. These mice exhibited excessive TNF-α production and increased susceptibility to lethal septic shock. LPS stimulation of macrophages elevated NF-κB levels in macrophages from merkd mice, suggesting that Mer may normally act to inhibit the LPS pathway. These results delineate a novel inhibitory pathway via a cell surface tyrosine kinase receptor, Mer, which appears to be critical in regulating immune responses to LPS and endotoxic shock. A mer cDNA probe was created by using RT-PCR amplification from mouse fetal liver with the specific oligonucleotide primers 5′-GTGGCAGTGAAGACCATGAAGTTG-3′ and 5′-GAACTCCGGGATAGGGAGTCAT-3′. The resulting 574-bp murine mer cDNA fragment was used to screen a 129/Sv mouse genomic library to isolate genomic fragments (Stratagene, La Jolla, CA). The tyrosine kinase-encoding region of the mer gene was replaced with the neomycin resistance gene from the pJNS2 plasmid 18 (Fig. 1⇓A). The herpes simplex virus-thymidine kinase gene from the targeting vector was positioned 3′ of the homologous arms to select against random recombination events. Gene targeting into the E14TG2a embryonic stem cells 19 was performed as previously described 20 . The resulting chimeras were bred with (C57BL/6 × DBA/2)F1 mice, and heterozygous merkd mice were intercrossed to produce mice homozygous for the mer gene mutation or wild-type mer. Targeted inactivation of the kinase domain of the murine mer gene. A, Schematic representation of the kinase encoding region (top box indicates beginning and ending amino acids targeted with appropriate nucleotide sequences) and the resulting targeted mer construct. Restriction enzyme sites indicated are: N, NotI; B, BamHI; O, XhoI; R, EcoRI; S, SpeI; and X, XbaI. 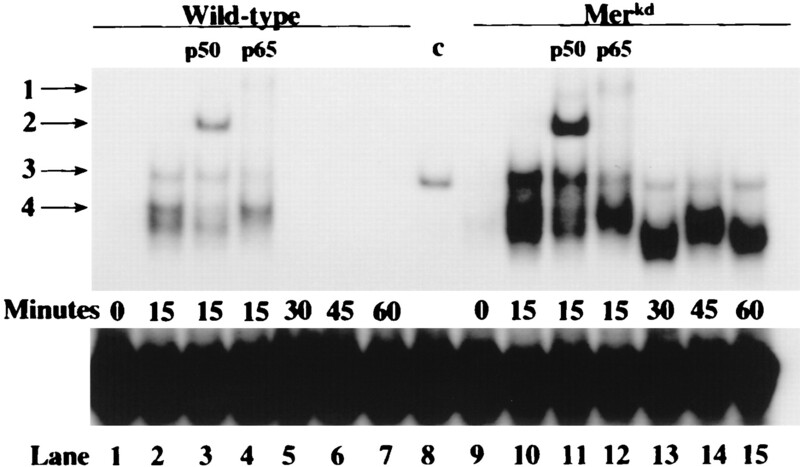 B, Representative Southern blot analysis of mouse genomic DNA. The DNA was isolated from tail biopsies and digested with EcoRI, separated by electrophoresis, and hybridized with the BamHI 3′-specific probe. C, Deletion of the Mer kinase encoding region was confirmed at the mRNA level by PCR analysis using equivalent amounts of cDNA template from PECs. G3PDH (control for cDNA concentrations), the extracellular fibronectin-type III (FNIII), or the targeted kinase region (Kinase). Lane 1 contains m.w. marker; lane 2 (wild-type) and lane 3 (merkd) are standardized expression of G3PDH; lane 4 (wild-type) and lane 5 (merkd) show the amplification of the extracellular fibronectin-type III (FNIII) domain; and lane 6 (wild-type) and lane 7 (merkd) are the amplification of the cytoplasmic kinase region (Kinase). For the RT-PCR analysis of mer and merkd expression, the following additional primer sets were used: glyceraldehyde 3-phosphate dehydrogenase (G3PDH),4 5′-CATGTAGGCCATGAGGTCCACCAC-3′ and 5′-TGAAGGTCGGTGTGAACGGATTTGGC-3′; for the external fibronectin-type III domain of the mer gene, 5′-TACCTCTGCTTCGCCACATCT-3′ and 5′-GGAAGACCAAGAGCCGTTTCA-3′; and for the kinase domain, 5′-GTGGCAGTGAAGACCATGAAGTTG-3′ and 5′-GAACTCCGGGATAGGGAGTCAT-3′. RNA from peritoneal exudate cells (PECs) was extracted as described by Chomczynski 21 . The titration experiments used LPS (Escherichia coli O55:B5; Sigma, St. Louis, MO.) doses ranging from 25 mg/kg to 200 mg/kg delivered to each mouse by i.p. injection. merkd and wild-type mer animals (6–8 wk) were given LPS at 100 mg/kg i.p. and monitored for morbidity over the indicated time course. Control mer animals were given equivalent volumes of sterile PBS. For in vivo neutralization of TNF-α, 6-wk-old merkd animals were given i.p. either 250 μg of hamster anti-TNF-α Ab (Genzyme, Cambridge, MA) or irrelevant isotype-matched hamster Ab, L2-3D9 (kindly provided by Dr. Robert Schreiber at Washington University School of Medicine, St. Louis, MO), 6 h before lethal challenge with LPS (100 mg/kg). Control merkd animals were given LPS alone i.p., and additional controls were given sterile PBS. Tissues for histological analysis were removed from euthanized animals and placed in 10% buffered formalin. Samples were paraffin embedded, 5 μm serially sectioned, and stained with hematoxylin and eosin for microscopic observation. For in vivo serum TNF-α concentrations, naive wild-type or merkd 6- to 8-wk-old animals were challenged with 100 mg/kg of LPS, and, at the indicated time points, serum samples were obtained by tail-vein bleed. TNF-α concentrations were quantified using anti-TNF-α Ab in a sandwich ELISA technique (PharMingen, San Diego, CA). Recombinant TNF-α as a standard control and Ab to TNF-α was purchased from Genzyme (Cambridge, MA). Statistical analyses were performed using standard Student’s t test with unequal variance. TNF-α secretion by cultured macrophages was assessed by ELISA. Mice (6–8 wk) were given 3 ml of aged 3% thioglycolate (Difco, Detroit, MI) i.p. and PECs recovered by sterile PBS lavage on the third day. A total of ∼2 × 105 cells/well were cultured in 96-well plates in standard RPMI 1640 medium with 1% prescreened FCS. Following a 72-h adjustment period, the PECs were given 100 ng/ml LPS (E. coli 055:B5; Sigma) in culture medium. Supernatants were harvested at the indicated time points, and TNF-α concentrations were quantified by ELISA. All RNA samples were extracted by standard methodologies from PECs following 30 min of in vivo treatment i.p. with either 10 μg of LPS or an equivalent volume of PBS as a control. Equivalent amounts of 15 μg of total RNA from each sample were analyzed as indicated by the ribosomal band. For calculations, background cpm were subtracted from TNF-α and ribosomal bands. The count for each of the TNF-α transcripts was divided by the ribosomal counts to provide relative amounts of transcripts. This number for TNF-α corrected to ribosomal levels in the LPS-treated macrophages from wild-type mice was divided by the number from the untreated wild-type group to give the increase of TNF-α transcripts in response to LPS. Similar calculations were done for counts from macrophages of merkd mice. The overall fold induction denotes the magnitude of the TNF-α induction from merkd over the TNF-α induction observed in wild-type. Thioglycolate-elicited PECs were isolated after LPS stimulation (10 μg), and nuclear extract samples were prepared from 1.0–3.0 × 106 cells as previously described 22 , except omitting dialysis of samples. EMSA were performed by incubating 3 μg of extract with end-labeled κB3 site of the 5′ murine TNF-α promoter element (5′-AGCTCAAACAGGGGGCTTTCCCTCCTC-3′) in binding buffer (250 mM NaCl, 50 mM Tris (pH 7.6), 50% glycerol, 5 mM DTT, 2.5 mM EDTA, and 2 μg poly(dI:dC) for 20 min at room temperature. The underlined sequence is the consensus κB binding element. Supershifts were performed by incubating extracts with Ab to p50 or p65 (Santa Cruz Biotechnology, Santa Cruz, CA) for 10 min before addition of probe. Significance for survival time plots between two groups were calculated using a logrank analysis consulting the χ square distribution with 1 df. Other statistical analyses utilized the Student’s t test with unequal variance. 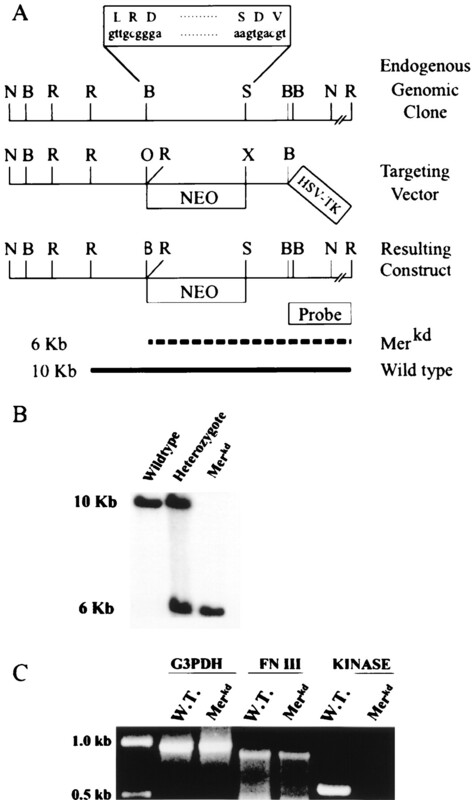 merkd mice were generated from embryonic stem cell lines in which the neomycin resistance gene replaced the last exon encoding the 3′ end of the Mer kinase domain by homologous recombination (Fig. 1⇑A). The mutation involved the loss of 53 residues in the activation-loop domain of the Mer kinase region, including the recently described autophosphorylation sites on the cytoplasmic tail of the Mer receptor, tyrosine residues 749, 753, and 754 23 . This recombination introduced a novel EcoRI site into the locus, allowing detection of the mutated merkd allele as a 6-kb fragment by Southern blot analysis from the wild-type allele, which is a 10-kb fragment (Fig. 1⇑B). The expression of a mutated mer was verified by RT-PCR of mRNA derived from macrophages contained in PECs isolated from merkd animals (Fig. 1⇑C, lane 7). The extracellular fibronectin domain (FNIII) of mer was expressed in both PECs from wild-type and merkd mice (lanes 4 and5); however, only wild-type mice expressed the cytoplasmic kinase domain (lane 6), and not the macrophages, from merkd mice (lane 7). The specific mutation in mer permitted functional analyses in signal transduction and avoided possible developmental anomalies that may have arisen from complete ablation of the gene. Although mer mRNA has been detected as early as the 8-cell embryo stage 8 , merkd mice exhibited no gross developmental anomalies. In addition, while mer mRNA was expressed at high levels in testis and ovaries, and mer-like sequences have been implicated in sperm function 24 , homozygous merkd mice were produced at the expected Mendelian frequency. In addition, mer mRNA expression was found in a number of tissues, including kidney, liver, brain, spleen, and bone marrow 8 ; however, organs of adult merkd animals were morphologically normal with the exception of enlarged spleens. We initially tested responses of macrophages from merkd mice to LPS. Our observations, using ELISA assay to detect TNF-α, showed that in vitro LPS stimulation of PEC resulted in significant heightened secretion of TNF-α into the supernatants, compared with macrophages from wild-type mice (data not shown). To determine whether merkd animals responded differently to bacterial endotoxin, we assessed in vivo LPS-toxicity in wild-type control and merkd mice. In a dose-response study of 25–200 mg/kg of LPS administered i.p. into mice, it was determined that the LD100 for merkd animals (100 mg/kg for merkd animals) was half that of control mice (200 mg/kg for wild-type animals; data not shown). At the 100-mg/kg dose of LPS, the merkd animals rapidly succumbed to septic shock with 52.9% alive by 24 h (9/17), and only 11.8% (2/17) of the mice survived to 96 h (Fig. 2⇓A). Thus, 88.2% of the merkd mice (15/17) died from endotoxic shock induced by LPS. In contrast, more than 93.3% (14/15) of the wild-type control mice survived this dose of LPS. The increased sensitivity of merkd mice to endotoxic shock (p < 0.0001) suggests that Mer may attenuate responses to LPS. merkd animals showed increased susceptibility to endotoxic shock and death. A, LPS-induced toxicity (100 mg/kg) and morbidity was observed and compared in merkd (open circles) and wild-type animals (filled squares). These data are a compilation of three separate experiments (n = 17 for merkd, and n = 15 for wild-type mice). Additional animals were given equivalent volumes of sterile PBS to control for endotoxin contamination. Logrank analysis of merkd mice compared with wild-type mice indicates p < 0.0001 in the χ square distribution. B, Serum TNF-α levels in vivo following LPS challenge. Serum from wild-type (solid bars) and merkd (open bars) animals was collected by tail-vein bleed at the indicated times following treatment with 100 mg/kg LPS. TNF-α was analyzed by ELISA, and the data is compiled from a minimum of four separate animals at each time point; p < 0.04 at 1 h.
To determine the cause for increased sensitivity to endotoxic shock, we assessed whether TNF-α production correlated with the heightened morbidity in the merkd mice. Serum TNF-α was quantitated before and during LPS challenge (at 100-mg/kg dose) of merkd mice and wild-type animals. Both merkd and wild-type animals had a rapid elevation in TNF-α 1 h post LPS administration (Fig. 2⇑B), consistent with published observations. However, the merkd animals responded by secreting nearly 3-fold higher TNF-α serum levels than wild-type mice within the critical first hour (1882.8 pg/ml vs 610.5 pg/ml, p < 0.04) (Fig. 2⇑B). This suggests that greater susceptibility to endotoxic shock in merkd mice may be due to excessive production of TNF-α. Evidence of TNF-α-mediated endotoxic shock was observed in the small intestine by both gross morphology (bowel dilatation) and histopathology. Compared with wild-type controls (Fig. 3⇓, A and C), the LPS-treated merkd mice exhibited increased lesions and hemorrhagic necrosis in the bowel (Fig. 3⇓, B and D), indicated by greater fluid accumulation, and an increased infiltration of red cells (arrowheads) and leukocytes (L) into the villi (Fig. 3⇓D). The morphology of the intestinal villi was degenerated in the septic bowel of merkd mice (Fig. 3⇓D) and showed numerous involutions and loss in the brush border of the villi (arrows). In contrast, the small intestine from LPS-treated wild-type animals demonstrated the maintenance of the smooth brush border and structure of the villi (Fig. 3⇓C), with only a slight increase in leukocyte cells (no RBCs apparent in villi). This pattern of morphological changes was typical of TNF-α-mediated destruction of tissue 25 and was consistently greater in merkd mice suggesting Mer functions to modulate TNF-α production in vivo. Histological observations showed increased pathology in the merkd animals. 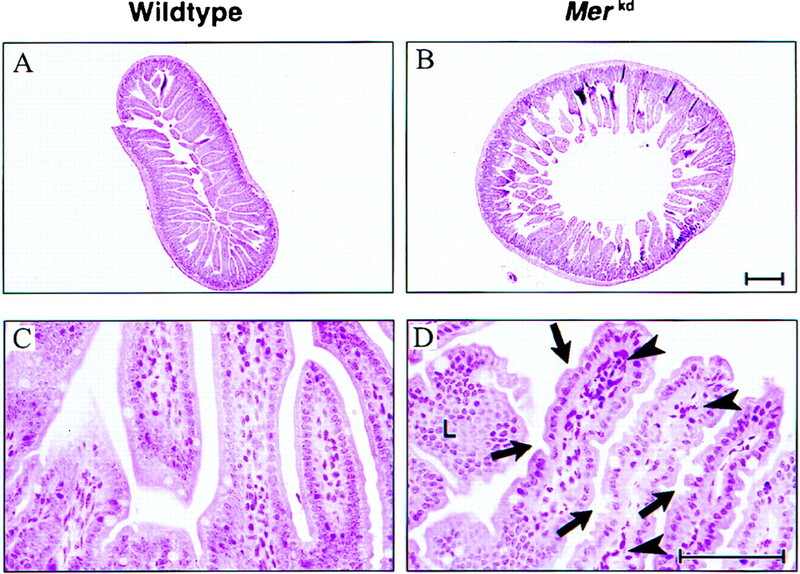 Histological samples from the small intestine of wild-type mer (A and C) and merkd (B and D) mice were taken 22 h after LPS treatment (100 mg/kg). Solid arrowhead indicates the RBC infiltration, and the solid arrows indicate the loss of the typical smooth enterocyte brush border on the intestinal villi of merkd animals. The leukocyte (L) influx into the villi can also be observed. A and B, ×250 magnification. C and D, ×1000 magnification with the scale bars representing 100 μm. The panels shown are representative of repeated observations from three animals. To confirm the role of TNF-α in the endotoxic death of merkd animals, we protected merkd mice from a lethal dose of LPS by pretreatment of merkd animals with an anti-TNF-α mAb. A total of 75% of the anti-TNF-α Ab-treated merkd mice recovered from this LPS challenge compared with 13% of the merkd mice (p < 0.005) given PBS only and none of the merkd mice pretreated with an irrelevant isotype-matched control Ab (Fig. 4⇓). The 75% survival rate of anti-TNF-α Ab-treated merkd mice was also similar to survival values (80% survival) previously published for protecting mice from endotoxic shock with this Ab 26 . This observation suggested that overproduction of TNF-α was the key mediator of the observed sepsis and pathology in the merkd mice, and merkd mice did not have an alternative mechanism for the induction for endotoxic shock. 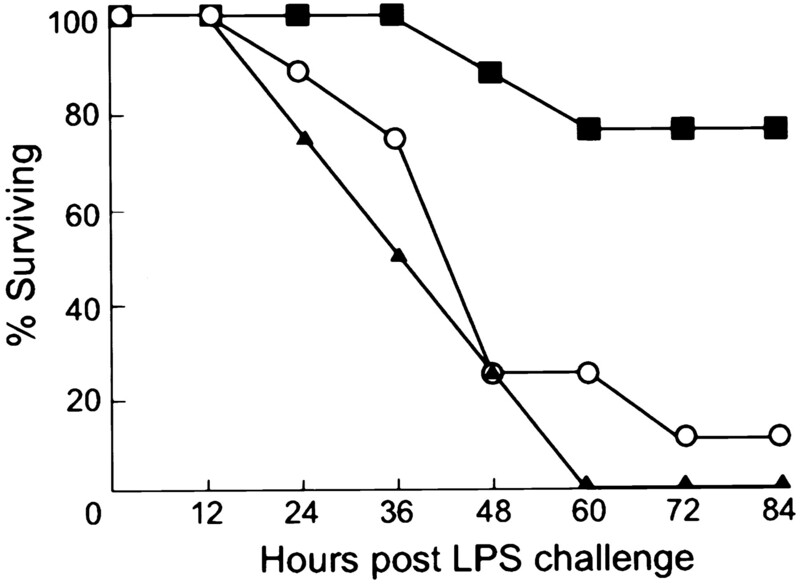 Abrogation of lethal LPS challenge in merkd animals by anti-TNF-α Ab. merkd mice pretreated with the anti-TNF-α neutralizing Ab (26) (filled squares) before lethal LPS challenge (100 mg/kg) demonstrated a significant increase in survival rate when compared with merkd mice without Ab treatment (open circles) or those pretreated with an isotype-matched irrelevant control Ab (solid triangles) (see Materials and Methods). This is a compilation from two separate experiments (n = 8 for TNF-α Ab-treated mice; n = 4 for control Ab-treated mice; and n = 8 for only LPS-treated mice). Logrank analysis of merkd mice treated with neutralizing Ab compared with control merkd mice was significant (p < 0.005). The increased level of TNF-α in serum of merkd mice (Fig. 2⇑B) suggested that LPS could be altering TNF-α expression in macrophages. Indeed, macrophages from merkd mice that were challenged with LPS in vitro showed increased secretion of TNF-α into supernatants when compared with macrophages from wild-type mice (Fig. 5⇓A). TNF-α levels from macrophages of merkd mice and wild-type mice increased over a 9-h period before subsiding. Most importantly, TNF-α levels from macrophages of merkd mice were twice that of the TNF-α production from macrophages of wild-type mice. In addition, TNF-α transcripts from LPS-stimulated macrophages from merkd mice were elevated compared with mRNA levels from macrophages of wild-type mice. We isolated RNA from macrophages of wild-type and merkd mice during LPS challenge. Fig. 5⇓B is a representative Northern blot showing increased TNF-α mRNA (6-fold) from macrophages of merkd animals stimulated with LPS over untreated macrophages. In contrast, macrophages from wild-type mice showed only a 2-fold increase in TNF-α transcripts compared with unstimulated macrophages. The 6-fold induction of TNF-α transcripts from macrophages of merkd mice is three times greater than the 2-fold induction of TNF-α transcripts from macrophages of wild-type mice. This observation was consistent with the elevated TNF-α serum protein levels observed in vivo from merkd samples (Fig. 2⇑B) and production of protein in vitro (Fig. 5⇓A). These data suggest that macrophages that lack a functional Mer have an increase in TNF-α expression. Increased TNF-α and TNF-α mRNA production from macrophages of merkd animals. A, TNF-α secreted by LPS-stimulated macrophages from wild-type mice (closed squares) were compared with macrophages from merkd mice (open circles) in vitro. Concentration of TNF-α was assayed at the indicated time after LPS treatment. Statistical analysis indicated ∗, p < 0.05 and ∗∗, p < 0.01. B, Northern blot analysis demonstrating elevated levels of TNF-α transcripts in merkd samples. Lane 1, PECs from untreated wild-type animals. Lane 2, PECs from wild-type animals challenged with LPS. Lane 3, PECs from untreated merkd animals. Lane 4, PECs from merkd animals challenged with LPS. Equivalent total RNA per group is indicated in the bottom panel by the ribosomal band for each sample. The increase in TNF-α secretion and TNF-α mRNA transcripts indicate that Mer may be altering the transcriptional regulation of the TNF-α gene. Since the 5′ promoter region of TNF-α contains three cis-acting NF-κB sites 27, 28 , the increased sensitivity to endotoxic shock and the overproduction of TNF-α mRNA and protein may be due to heightened levels of the transcriptional activator, NF-κB 29, 30 . We assessed the activation of NF-κB in vivo using an oligonucleotide probe of the κB3 site in the 5′ promoter of the murine TNF-α gene. Elevated (3.5-fold at 15 min) and sustained NF-κB activity was observed in the nuclear extracts of macrophages from LPS-treated merkd mice (Fig. 6⇓, band 3, lanes 10,and 13–15) at levels greatly exceeding those observed in macrophages from wild-type mice (lanes 2, and 5–7). In LPS-stimulated macrophages from wild-type mice, NF-κB was barely detectable at 30 min and was absent at 45 and 60 min post LPS stimulation. In contrast, macrophages from merkd mice showed sustained NF-κB induction beyond 30 min. Ab supershifts indicated that the p65 and p50 subunits were contained in the active NF-κB heterodimeric complex (arrow 3, lanes 3, 4, 11, and 12). The p50/p50 homodimeric complex (arrow 4) appeared to fluctuate in binding activity; however, this was not apparent for the p65/p50 NF-κB (arrow 3) activity during the time course (lanes 10, 13, 14, and 15). Furthermore, unstimulated samples from macrophages of merkd mice showed a low basal level of nuclear NF-κB, while wild-type samples did not. This may indicate that macrophages from merkd mice may have a consistent low-level translocation of NF-κB. These observations strongly suggest that mer influences LPS-dependent TNF-α production in macrophages by actively regulating NF-κB activity. The increased binding of NF-κB from macrophages of merkd samples to the κB3 site of the TNF-α promoter. Representative EMSA of nuclear extracts from PECs isolated from LPS-challenged wild-type (lanes 1–7), merkd animals (lanes 9–15), or Rat-1 p65/p50 control (lane 8). The indicated minutes reflect the treatment period in vivo with LPS (10 μg) before harvest of PECs for nuclear protein extraction. Ab supershift with anti-p50 (lanes 3 and 11) and anti-p65 (lanes 4 and 12) show p65 complexes (arrow 1) and p50 complexes (arrow 2). p50/p65 complexes are indicated by arrow 3, and p50/p50 homodimers are indicated by arrow 4. Uncomplexed probe alone is in lane 1 (P) and free probe in all samples is shown in the lower panel. This EMSA is representative of four separate experiments. Macrophage response to bacterial endotoxin results in the secretion of TNF-α 31 . Our report suggests an additional novel pathway regulating TNF-α and host immune response to endotoxic shock. Loss of Mer signaling abrogates this check on TNF-α secretion in vivo. We suggest that merkd mice challenged with a sublethal dose of LPS succumb to endotoxic shock due to TNF-α-mediated tissue injury. First, excessive production of TNF-α in vivo (Fig. 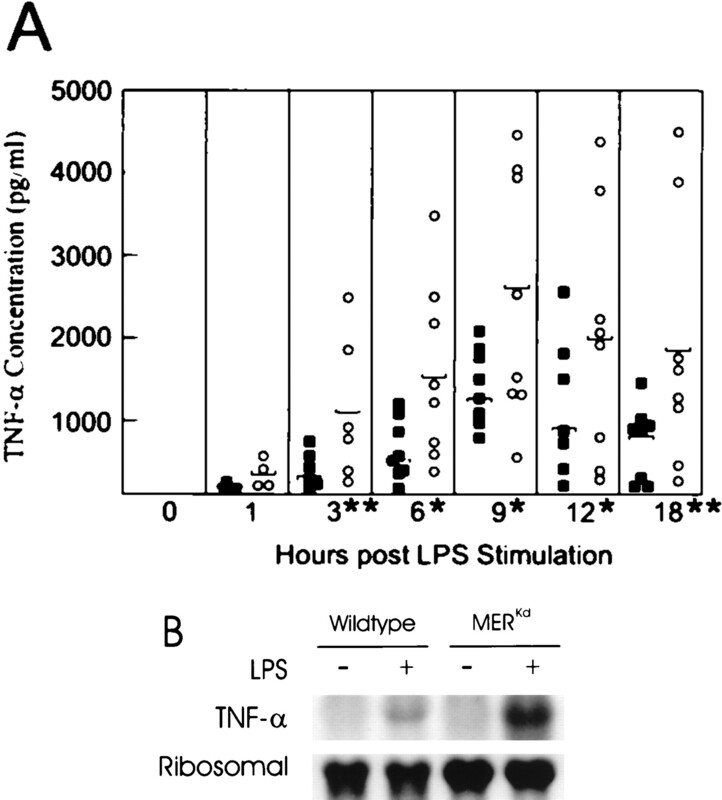 2⇑B) was corroborated in vitro using LPS-stimulated macrophages from merkd and wild-type mice (Fig. 5⇑A). The macrophages from merkd mice showed an average 2-fold greater amount of TNF-α secretion compared with PECs from wild-type animals (Fig. 5⇑A). This increase in TNF-α in vivo and in vitro is a consequence of an absent Mer signal. Second, the anti-TNF-α Ab attenuated death of LPS-challenged merkd mice, again indicating that the hyperresponsiveness of merkd animals to LPS is mediated by TNF-α. In addition, another cytokine, IL-1, is also regulated similarly by Mer as it is hypersecreted in LPS-challenged merkd mice (data not shown). This suggests that additional inflammatory cytokine production may be modulated by mer signal transduction. The mechanism for elevated TNF-α production includes increased TNF-α mRNA as presumably due to an increased translocation of NF-κB to the nucleus. Taken together, these data suggest that the Mer receptor on macrophages serves to attenuate cytokine responses to bacterial endotoxin and may be a critical inhibitory pathway to guard against excessive tissue damage in endotoxic shock. The signal transduction pathway beyond the activation of the Mer receptor tyrosine kinase is unknown; however, we showed greater p65/p50 NF-κB-binding complex (Fig. 6⇑) that correlated closely with the greater production of TNF-α transcripts (Fig. 5⇑B). Our data suggest that mer functions to modulate the LPS-dependent TNF-α cytokine production by attenuating LPS-dependent NF-κB activation. A detailed analysis of points for interaction between Mer and LPS signaling will be needed to determine whether the Mer signal attenuates all activities stimulated by LPS, or whether putative inhibition of NF-κB nuclear translocation is selective. However, it is clear that a lack of a Mer inhibitory signal in merkd mice results in elevated and prolonged NF-κB activation, causing excess macrophage activation and TNF-α production. Receptor tyrosine kinases are often discussed in the context of growth and/or differentiation, yet deletion of the kinase-signaling capacity of Mer does not result in attenuation of growth or development in merkd animals. This report is the first to demonstrate that the Mer receptor tyrosine kinase is involved in modulating or dampening cell activation in the response to LPS. Our results indicated that merkd mice are hyperresponsive to LPS and routinely died when challenged with doses of LPS below the lethal dose for control animals (Fig. 2⇑A). It has been speculated previously that tyrosine kinase activity is important in the LPS-signal transduction process 32, 33 ; however, Meng and Lowell 34 have shown that the Src-like kinases (Fgr, Hck, and Lyn) are not the obligatory kinase components of the LPS signal cascade. In fact, lack of Hck and Fgr impaired inflammation due to an inability of neutrophils to migrate and damage tissue 35 . It appears that Mer is not utilizing such nonreceptor tyrosine kinases in signal transduction. This suggests that additional intracellular signaling mechanisms or receptors exist to regulate the LPS response in monocytes. Furthermore, recent reports have demonstrated that inhibiting tyrosine kinase activity by tyrphostins (AG 126) actually prevented LPS-induced septic shock in mice and, additionally, tyrphostins block the production of TNF-α of cultured primary macrophage 36 . These findings emphasize the importance of tyrosine kinase activity in the positive aspects of LPS signal transduction. Our results showed that deletion of the Mer cytoplasmic tyrosine kinase domain heightened TNF-α production implying that at least one tyrosine kinase inhibits LPS-dependent signaling. These findings establish the first in vivo function for Mer tyrosine kinase activity and for the Axl/Tyro3/Mer/Rek family of tyrosine kinase. We have established that Mer influences the amount of NF-κB, and we have observed abnormal Jun-N-terminal kinase activity but not p38 in LPS-challenged macrophages from Merkd mice (our unpublished observation). Thus, it appears that Mer may affect specific signal transductions pathways and not a general inhibition of cell activation. Further experimentation is focused at identifying the control point at which Mer down-regulates signal transduction. The results reported here also suggest a novel inhibitory pathway regulating the response to LPS and endotoxic shock that may be exploited clinically. We thank Robert Schreiber (Washington University School of Medicine, St. Louis, MO) for the gift of Ab (L2-3D9); Dr. Al Baldwin (University of North Carolina, Chapel Hill, NC) for the gifts of Abs to NF-κB p50 and p65 subunits and Rat-1 nuclear extracts; Dr. Cindy Lawler for providing support with statistical analyses; Dr. Robert Bagnell, Teresa Bone-Turrentine, Brian Garges, Anne Latour, Dr. Marty Mayo, and Dr. Elizabeth Hicks for their excellent technical expertise; and Drs. Rona Scott, Philip Cohen, and Jenny Ting for helpful discussion and critical review of this manuscript. ↵1 This work is supported in part by National Cancer Institute Grant RO1-CA68346 (to H.S.E. ), National Institutes of Health Grants R29-NS35372 (to G.K.M. ), PO1-DK 38103, and RO1-DK (to B.H.K. ), equivalent funding from the National Heart, Lung, and Blood Institute, and National Multiple Sclerosis Society Grant MS-RG 2754 (to G.K.M.). ↵2 H.S.M. and G.K.M. are joint senior authors. ↵4 Abbreviations used in this paper: G3PDH, glyceraldehyde 3-phosphate dehydrogenase; PEC, peritoneal exudate cells; EMSA, electromobility shift assay. Mohn, A., and B. Koller. 1995. Genetic manipulation of embryonic stem cells. In DNA Cloning-Mammalian Systems: A Practical Approach. Oxford University Press, Oxford, p. 142.